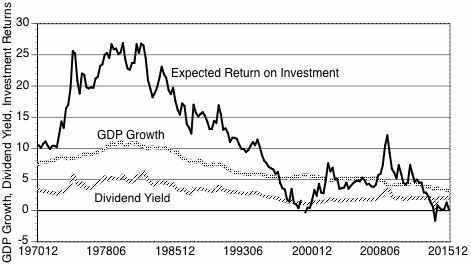 The expected return on investment of a portfolio of U.S. stocks ix correlated with GDP growth. An examination of indicators since 1970 shows that when GDP growth peaks at 10.9% in 1980, the expected return on investment reaches a top at 26.9% while dividends reach 5.68%. Descending from 1978 GDP growth has declined to 3.2% in 2015 while the expected return on investment has becomes negative and presently hovers at 0.2% while dividends remain at 2%. A retired senior investor can view these indicators as signs that materially deteriorated investment conditions have prevailed since 1978.